Carmen G. Carmen Guardiola Soto, age 83, of Toledo, passed away peacefully on Monday, September 5, 2011 at Ebeid Hospice, Sylvania, surrounded by her loving family. She was born on July 16, 1928 in Carnes, TX to Adolph and Juanita (Gutierrez) Guardiola, and raised in Laredo, TX. Carmen worked for the Dura Corporation, retiring from there in 1975. She also worked for 5 years at O’Niel’s Greenhouse. She was a former parishioner of St. Hedwig Catholic Church in Toledo and St. Joseph Catholic Church in Erie, MI. A devout Catholic and a woman of great faith, Carmen was a member of the Crusillo Movement prayer group, the St. Peter and St. Paul parish prayer group, and the Guadalupe Society. She was proud of her Mexican heritage and helped organize the annual Fiesta in Erie, MI. She also loved the outdoors, especially flowers and birds. 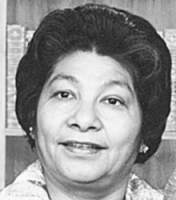 Carmen’s husband, Manuel Soto, passed away on March 8, 2003. Survivors include their son, Manuel (Sara) Soto Jr.; daughter, Armandina “Mandy” (Frank) Gardull; Carmen’s sister, Margaret Garza; half sisters, Martha Vargas, Erma Guardiola and Ofilia Guardiola; half brother, Cerilo Guardiola; 7 grandchildren; and 17 great-grandchildren. In addition to her husband and parents, she was preceded in death by her step mother, Theresa Guardiola; brothers, Guadalupe, Francisco and Domingo “Polo” Guardiola; half sister, Molly Mendes; and half brothers, Adolph Jr. and Frank Guardiola. Family and friends may visit on Friday from 2-8 p.m. at Sujkowski Funeral Home Northpointe, 114-128 E. Alexis Rd., with recitation of the Rosary at 7 p.m. Funeral Services will begin on Saturday at 9:15 a.m. in the funeral home and continue with the Funeral Mass in St. Hedwig Catholic Church at 10 a.m. Interment will follow in Toledo Memorial Park Cemetery. Memorial contributions can be given to Hospice of Northwest Ohio or Ebeid Hospice, Sylvania. Please view and share condolences and memories at: www.sujkowski.com.